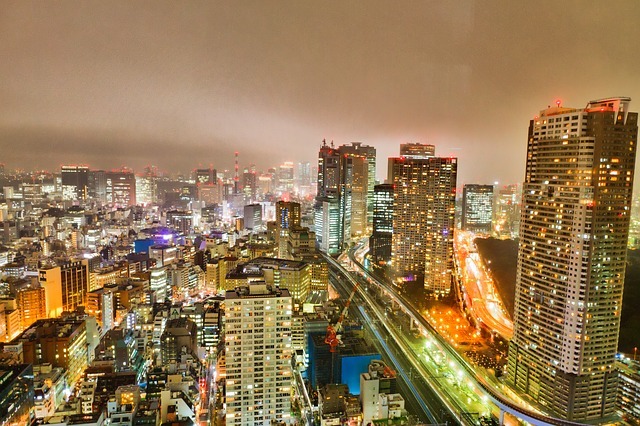 If you decide to travel to Japan, you must stop by the largest metropolitan area in the world–Tokyo! This massive city is the capital of Japan and makes up the prefecture of Tokyo Metropolis. The metropolitan area of Tokyo has a population of thirteen million people; the surrounding Tokyo area has roughly thirty-five million with even more in the outskirts. This city is incredibly busy and full of life, so there are plenty of things to see and do! Tokyo began as a fishing village named Edo more than 500 years ago. Tokyo started to grow during Japan’s medieval period once it became home to the shogun (who was in charge of the samurai). Eventually, many sub-cultures, surrounding cities, and people morphed and transformed the area into the Tokyo it is today. The Tokyo of today is a hub for technology and business, but it also has many great tourist attractions for you to enjoy! This tower is for communication purposes, but it also has observation decks. It is 1,091 feet tall, making it the second tallest man-made structure in Japan. The tower gets it appearance from the Effiel Tower. At this magnificent structure, visitors can stop by the first observation deck (490 feet up in the air), the second observation deck (at 820 feet in the air), and the four-storey structure at the bottom of the tower (which has restaurants, museums, and shops). The sight, even from the first observation deck, is truly amazing. For miles around, all you can see are the huge buildings of Tokyo. There are even a couple of clear windows built into the floor that let you get a look at the ground down below! Needless to say, if you’re afraid of heights, you should probably not enter the tower! Asakusa is actually a district of Tokyo. This area is famous thanks to its Buddhist temple–Senso-ji. Besides visiting the temple, you can also sometimes see religious festivals. There is also a small amusement park, theatres that show classic Japanese films, and plenty of shops. Akihabara is also a district of Tokyo. This district is also known as “Akihabara Electric Town” because it specializes in the sale of computers and all things electronic. You can purchase many types of new and used electronics here. You can visit brand name stores such as Laox, or you can venture a little further into Akihabara to find better prices! 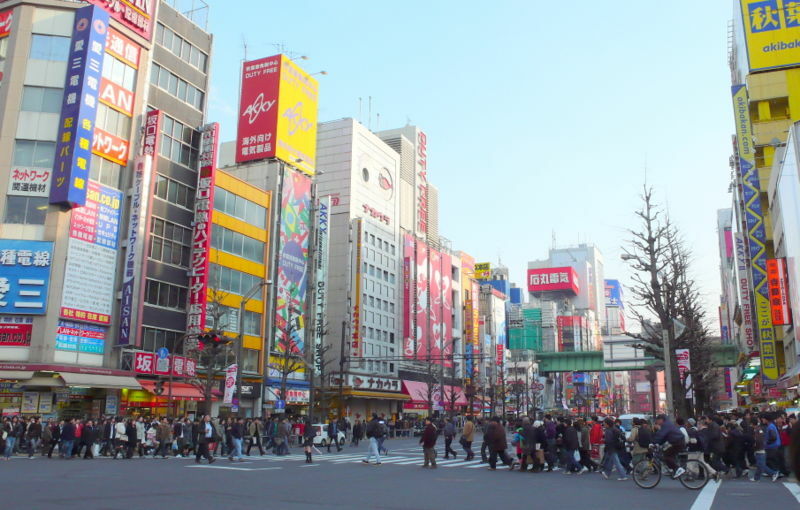 Shinjuku is considered one of the special wards of Tokyo. This area is a huge center for business–it also has the busiest station in the world! The goverment administration for Tokyo is also located here. There are tons of skyscrapers here, so it really does look like a business capital; however, Shinjuku is also a center for nightlife. The areas of Golden Gai and Kabukicho are full of restaurants, bars, clubs, and other similar establishments. If you’re interesting in a youthful center of Japan that specializes in fashion and nightlife, check out Shibuya. Shibuya is another special ward of Tokyo. The district of Harajuku in Shibuya is a fashion capital that attracts many styles and types of people who are interested in fashion. Some Japanese youths dress very extravagantly, almost like they are dressing up in costumes, in order to visit this area. The Shibuya crossing is a famous intersection that you have probably seen on TV or in a movie at some point. This area is located in front of the Shibuya Station, a very busy station in Japan. When the traffic stops, this intersection becomes filled with hundreds of people, all crossing the street in different directions. Tokyo Bay is a beautiful area to visit. Here you can see a replica of the Statue of Liberty as well as the Rainbow Bridge (modeled after the Golden Gate Bridge). You can walk right down to the water and enjoy the view of Tokyo across the bay (you can even remove your shoes and dip your feet in the water if you want!). There are also many barges in the water, and most of them (along with the buildings and the bridge) light up at night, making for one very beautiful display. There are also many shops and restaurants nearby, so you can enjoy a meal while looking out over the water. Although this place gets crowded and busy, it is a much calmer place than the rest of Tokyo to relax and enjoy the scenery. Since Tokyo is so huge with many different districts and wards, it can be difficult to find specific restaurants. Rest assured that there is a wide variety of cuisine available in Tokyo. There are traditional Japanese restaurants as well as many Western places to dine. If you love Italian food, check out Vinoteca. Although the food may not be considered authentic Italian food (you are in Japan, remember), it is still one of the best Italian places in Tokyo. For some amazing sushi, check out Daiwa Sushi. This restaurant is usually very crowded, but it is worth the wait! For some of the best Chinese food in the city, check out the China Room restaurant, located in the Grand Hyatt Tokyo at Roppongi Hills. If you’re in to Asian fusion, check out Daidaiya where you can dine on Thai, Chinese, and Japanese dishes. Tokyo has a little bit of something for everyone. No matter what part of Tokyo you are in, you are never very far away from any of the wards or districts. A simple ride on the subway will have you there in no time so you can enjoy everything that Tokyo has to offer. There are always plenty of restaurants, a variety of shops, magnificent structures, and interesting sights to see in this marvelous city. If you don’t like crowds of people, Tokyo may not be the best place for you; however, if you’re willing to step out of your comfort zone for a while, you can take advantage of all there is to do in the capital city of Japan!